Sweden – Massive Up-scaling of False-flagging to Nationwide High Crimes – Will it Make the Right-Wing Swedish Democrats to Kingmakers on 9 September 2018? The current Swedish Government, led by the Social Democrats, is governed by a coalition with the Green Party since 2014. Incumbent PM, Stefan Löfven, intends to continue his government and hopes to win on general election day, next Sunday, 9 September 2018. However, for years – ever since what they call the onslaught of undesirable immigrants, i.e. 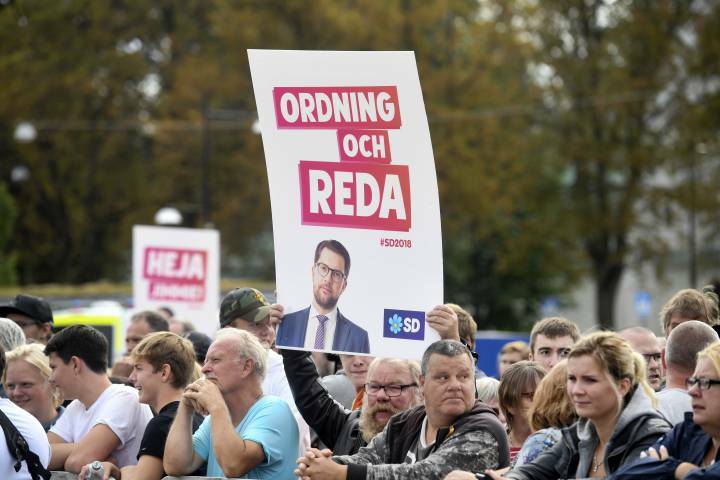 the “lesser people” from the Middle East and thereabouts – the extreme right, anti-immigration, eurosceptics ‘Sweden Democrats’ are on course to become the second-largest single party in the next parliament. On Facebook the party’s leader, Jimmie Åkesson, warned that “Sweden is on fire again”. He may have referred to the hundreds of cars set a blast this year in major Swedish cities – and the again likely refers to the same phenomenon at a lesser scale that has beleaguered Sweden already in previous years. Just a look at France. After a number of false flag attacks in which hundreds of people lost their lives – Macron was able to put the “State of Emergency” – akin to Martial Law – into the French Constitution. France today looks like a police and military state, in larger cities you find armed police and machine-gun touting military at every street corner. The sight has become the new normal. Are the French safer for it? Nope. Because the danger comes from within, not from outside. The danger comes from the very protectors which are complicit with those ‘hidden’ forces that want to maintain a police state that oppresses the public, so that this small all-controlling elite, can do what they want. Strange enough, a year before the last elections in Sweden, in 2013, there was a similar eruption of car burnings in Stockholm, at a more modest scale, but all the same. Someone must have felt this kind of terror, rather new for Europe, and that could easily be ‘pushed off’ to unhappy immigrants – of which surely there are plenty – might ignite the anti-immigrant discourse. – This time it seems to work. The Social Democrats are way down in the opinion polls and the Swedish Democrats, way up, poised to become the key player in the next government. France is in the middle of Europe, ready to break down any potential peoples’ uprising. Is Sweden going the Nordic way of France? – The risk is there, if the extreme right wins. – Are the Swedes conscious of this risk? – I doubt it. The corporate war propaganda tells them differently. And looking beyond one’s borders to learn, is hardly a nation’s forte. Its learning the hard way and discovering when it’s too late. Back to Sweden, in concrete, none of the two leading coalitions are predicted to have an absolute majority. The one led by the Social Democrats (Labor Party equivalent) is forecast to make 38.6% and the Conservative Alliance almost 40%. The right-wing, anti-immigrant and euro-sceptic Sweden Democrats have increased their adherents by about 50% since the 2014 elections and may get up to 20% at the polls – which may make them the Kingmakers. And that largely thanks to the street havoc, destruction and terror they organized. Not a good omen for Sweden. Of course, there is much more at stake than just the Swedish election – a country with barely 10 million inhabitants but a huge in surface (about the size of California) and with maritime borders facing Denmark, Germany, Poland, Russia, Lithuania, Latvia and Estonia. Sweden has been and is a neutral country, unaligned to such military associations like NATO. The possibly new incoming government, the way for which was prepared for at least five years – reminds of the Ukraine coup in February 2014, also prepared for at least 5 years, according to former Assistant Secretary of State, Victoria Nuland, that turned the Kiev Government into a pure Nazi crime nest, supported by the west and by NATO. It is very possible that Sweden may become a NATO country – one more on the door steps of Moscow. A NATO Sweden would be bordering on other NATO Russia fiends, Poland, Lithuania, Latvia and Estonia and could closely collaborate with them for possible aggression towards Russia – the northern build-up of troops could easily be channeled through a new NATO Sweden. Are the Swedes conscious of this potentially new perspective? – The extreme-right Swedish Democrats have stolen voters from all the parties under the pretext of the immigrant curse and danger. Western paid propaganda played an important role, like everywhere when right-wing and hegemonic forces are at play. If Sweden falls, Finland – another neutral and NATO-unaligned country – might also fall. Norway and Denmark are already part of this murderous monster-club. The northern attack route is being established. Swedish defense minister Karin Enstrom has said her country is not in NATO partly because the EU treaty contains its own security guarantee: “Who needs NATO if you have the Lisbon Treaty?” – Right. But the Lisbon Treaty is not engaging at all. Its not a European Constitution which would be binding for all member states, and which would allow Europe to build-up her own defense strategy and defense forces – and which would allow, or even force Europe to pull on the same string – and more importantly – in the same direction. All of this is not the case today. That’s why Europe is every time more integrated into NATO – NATO is absorbing the EU, one country and one military budget at the time. Karin Enstrom’s wise words – wise, inasmuch as we don’t want NATO – are wishful thinking, delusionary, unfortunately. It would need a massive awakening in Europe and a massive resistance buildup against NATO to come clear of this ever-growing threat on Russia that has the capacity to annihilate first Europe, then the world. Mr. Putin and Mr. Lavrov warn the west all the time – but are they listening? – At least for now, President Putin’s chess-playing excellence has avoided such a global catastrophe. Sweden is at the crossroads of going down the dangerous and destructive path of western aggression or stay neutral, remain a northern nation of integrity, ethics and peace. It is high time – and never too late – that the Swedes awaken to the danger that might await them this coming Sunday, 9 September. Swedes, you have proudly followed a socialist-leaning and social agenda for the last hundred years. Are you thoughtlessly risking abandoning this noble tradition – for false pretexts indoctrinated by a massive campaign of false flags? – I trust not.